Sony CMT-SBT300WB review | What Hi-Fi? If you’re looking for a well-specced hi-fi system at a reasonable price, the Sony CMT-SBT300WB is up there as one of the best. Packing an impressive array of features, including a CD player, FM/AM and DAB tuners, A2DP Bluetooth, NFC, DLNA, AirPlay, wi-fi and Apple-device playback over USB, there’s not much this little box of tricks can’t do. There’s no getting away from it. One of the first things you’ll notice is that everything you do on the SBT300WB comes with a delay. This includes tasks as frustratingly simple as turning the system on or opening the CD tray. Be prepared to see “Please Wait” flashing on the unit’s display. A lot. Get past this usability snag, and there’s plenty to get your teeth stuck into here. Like any Sony product, it looks the part, all brushed metal and high gloss front panel. It is quite a big receiver, but then it squeezes a lot in. Controls on the front offer the core functionality available through the remote. This includes source selection; a button for turning on Bluetooth; music controls; a large volume knob; and EQ and Bass Boost buttons. There’s also a front-mounted headphone port and that Apple-approved USB port. Getting the system onto our wireless network was easy using Sony’s free iOS- and Android-compatible NS Setup app, or you can hardwire an ethernet connection if you prefer. We’d choose this method for stability reasons. Once connected you can use AirPlay to play wirelessly from any compatible Apple device, and stream directly from Sony’s Music Unlimited service (subscription required) or any DLNA device sharing the same network. It’s simple to use and quick to get set up, but is a little restrictive with file support. WAVs and FLACs are not compatible, only allowing for MP3, WMA and AAC files. Finally, devices with built-in NFC (near-field communication) can connect to the SBT300WB with a single touch to the ‘N’ logo on the front. This will automatically set up the system for Bluetooth playback, without any need for manual pairing or setting changes. Stacks of features count for a lot, but it’s sound quality that really matters. And with this Sony, that somewhat falls behind its huge spec list. The good things work well – it has a nice, precise midrange that times well and offers plenty of clarity and insight into vocals. The warm tones of Adele’s Rumour Has It are conveyed with skill, while rhythmically it’s agile and stays light on its feet. However, overall things certainly feel tilted towards the treble more than we’d like. While bass is tight and well controlled, it comes off sounding lean and lacks the impact it needs to pull things back into balance. There’s little warmth or weight in the treble, so the system can sound harsh and thin, making it a rather tiring listen over long periods, particularly at higher volumes. While we found the rival Yamaha MCR-232’s treble could sound similarly sharp with certain recordings, this is more of a mainstay of the Sony’s character, and something we’d imagine would be much more difficult to live with day in, day out. The EQ is too heavy-handed to be much help, either. Just knocking the treble down a notch or two introduces a closed-in character to the presentation. 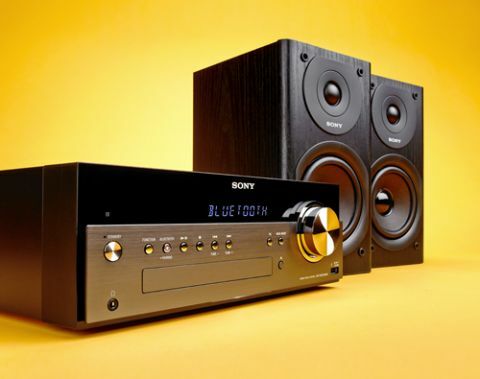 The Sony CMT-SBT300WB is an impressive system on paper, offering stacks of ways to playback your music. But in doing so, and at such a good price, it feels like Sony has dropped the ball elsewhere. It offers so many ways to play your music wirelessly, yet do so and that unrefined treble is prone to get harsher still. Combine this with its frustratingly slow response times and even this system’s feature list can’t save it from a three-star fate.